There’s a lot of talk these days about police militarization, but rarely does anyone mention that this is just part of a larger picture—namely, the militarization of society. For the uninformed, many combat vets have to struggle through the ironic situation they’re placed in on the Fourth of July. On the one hand, many Americans like to celebrate Independence Day by setting off fireworks. But if you’re a combat veteran who just returned from a war zone overseas, the explosions can actually trigger panic attacks and other health issues related to post-traumatic stress disorder. We might think that the guys that veterans that came home to join civilian militias like OAF Nation would be sympathetic to the needs and concerns of the guys that just got back from a war zone. 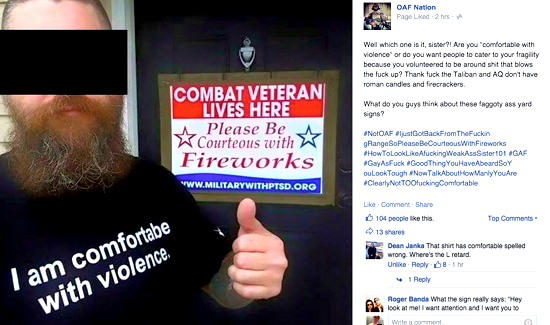 OAF Nation (Operation American Freedom) and a related account, Operator as F*ck, each posted identical homophobic posts mocking veterans who display such signs. OAF Nation is an excellent source of intelligence for any law enforcement professional who wants to learn about the increasingly radicalized anti-government extremist movement.